A couple of weeks ago we took some visitors for a day trip in the Troodos mountains. I wanted to show them the village of Kalopanayiotis, because I spent some time there a few years ago on a university project to conserve the wall paintings in the Monastery of St John the Lampadistis. I was curious to see how much had changed in the village in the 5-6 years since I was there last. The answer - well, a bit. There has been an effort to increase agrotourism in the area, to renovate old buildings using traditional materials and methods, and to open some of the villages up to a less invasive type of tourism than is found down on the coast. There were a few new rent rooms, or 'mountain suites' as they call themselves, and a couple of new places to eat. Apart from that, I must say the village (and the surrounding villages) still had the same sleepy charm and 'stuck in time' atmosphere that I had remembered. We had lunch in The Old Cinema Taverna, situated on the 'main road' running through village. 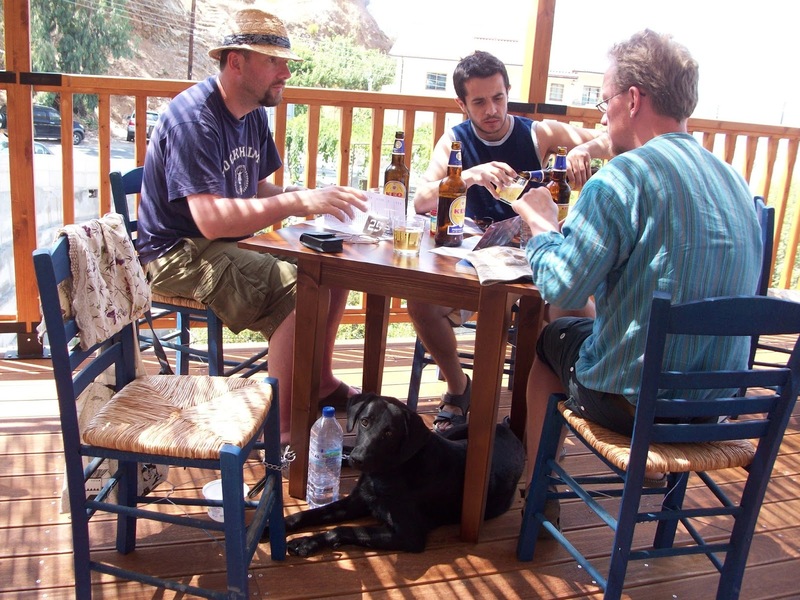 They have constructed a lovely wooden terrace that overlooks the valley that separates the village from the monastery. From the terrace you have great views out over the mountains. The staff were fine about Sage sitting with us, outside. After spending all morning in the car, and stopping to explore sites along the way, I think Sage was content to sit quietly in the shade and wait for small offerings of halloumi from the table above. We all ate halloumi in pitta, with a big salad and a beer, and I think we paid around 10E per person. We did get down to explore the Monastery afterwards, although I should say that this is not a very dog-friendly activity. Being 4 people, we were able to go in shifts, the others waiting in the shade with Sage. We had her within the Monastery grounds for a while, but were politely asked to leave. It is worth going to see, if you can organise to leave your dog outside. 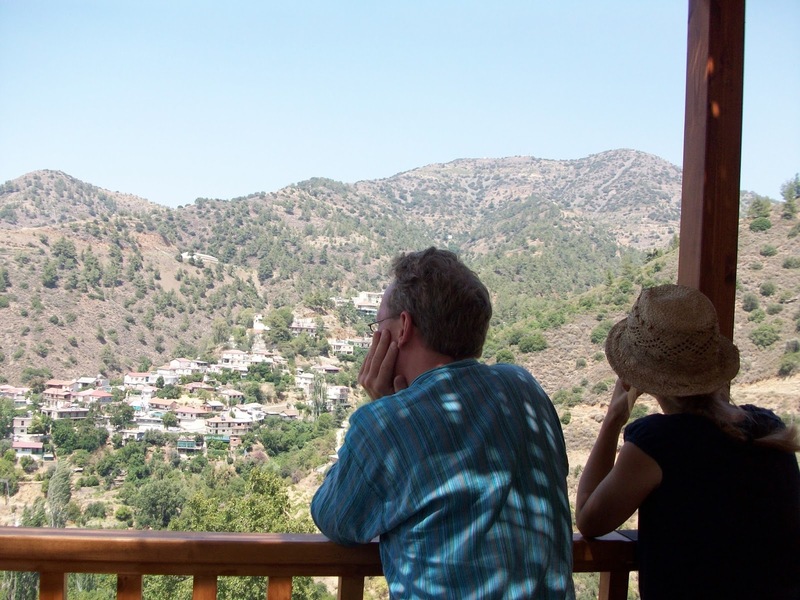 The Monastery is a UNESCO World Heritage Site, with some of the best preserved Byzantine wall paintings of all the churches in the Troodos. Former living quarters of the monks consist of a beautiful stone and timber construction around a small, flower filled courtyard. The Monastery church (dedicated to Saint Herakleidios) was founded in the 11th century, and some fragmentary wall paintings are dated to this time. The majority are from the 13-14th centuries, with a final addition in the early 16th century in the so-called Latin chapel. The Monastery has no entrance fee, and is open Tuesday-Sunday 08.00-13.00, 14.00-16.00 (and later in the summer months).